beautifully carrying the Haudenosaunee message of respect for the earth across North America. Movement. I call it a way to "honor and learn from the past to better work for a just future." segregationist system. After seeing the mugshots I decided to do a poster on the Riders. wonderful book Breach of Peace, available from SCW. Calendar. Daisy was a key figure in the 1957 Little Rock, Arkansas school desegregation struggle. you can afford it! ) from our friends. Thank you so much. Donations can be made during checkout or here using a credit card. Please note that your donation is not tax deductible. I do believe that art is a powerful force for change and you are one of the best examples of this idea. 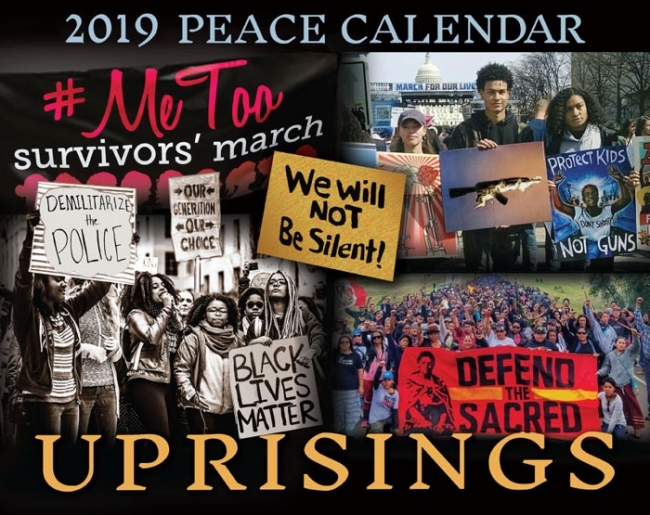 Dear Syracuse Peaceniks - the Peace Calendar is great. I hope to plug it everywhere I go. I am overwhelmed - I have just discovered your catalog..... Thank you for reflecting my visions back to me and providing substance. leafing through the calendar was like a kiss and a back massage. barbershop. All of them were grateful and all of them agreed 100% that "War Is A Racket." Carpe Diem. Thank you very much for your thoughtful & comprehensive catalog. I appreciate your including my statement about our 9-11 response on a poster. I am proud to make a contribution to such an important and inspiring, creative organization. I only wish I could afford more than $100 but even that is extending myself right now. I just want to thank you for your efforts to make our world a better place and to give me the opportunity to join your efforts!! blue in an otherwise depressingly grey political sky! It's needed more than you know!